Shop around Asia on Q ~ Philippine Freebies, Promos, Contests and MORE! 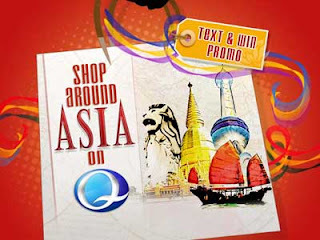 Watch, text and Win a trip and shopping spree in Q's Shop around Asia Promo. Just watch Q channel and wait for the daily trivia question. Text in your answer and you may just Win a trip to Hong Kong or Shanghai and a shopping spree. There are already winners for the earlier draws to Bangkok and Singapore. Tune in to Q and watch out for the Q VJs daily trivia questions.